Today’s the big day and I almost didn’t make it! Last week my computer bit the dust again and this time it was final. Grumpy took me to Best Buy and we found the netbook I wanted to hold me over until we can afford to buy me a nicer laptop to do all my blog work on. Friday night I had the netbook and Saturday I made this dish all over again! It certainly wasn’t a problem that I had to make it all over again because it was delicious! It is our reveal day for the Secret Recipe Club – Group A. My assigned blog was The Slow Roasted Italian and I was very pleased! I have been reading Donna’s blog for a little while now. The first two things that attracted me to her blog when I found it were her photos and her cocktails. I already knew I wanted to make this rice dish that she made. Donna’s dish, Saffron Walnut Rice Pilaf had been on my list to make already so this was my chance to do so for the SRC! This dish reminded me a lot of one my mom used to make when I was a young girl and that was the big attraction to make it. I enjoyed this trip down memory lane with this dish. Grumpy gave me a funny look when he saw the black olives in the rice, but he gave it a try and went back for seconds, so I don’t think they were a bad thing! There is some left over that I plan to take with my lunch today and I know the smell that it will create when reheating it will be wonderful and if anyone is like me when someone is reheating something that smells so good, they will be jealous! As I was reading over the recipe for this rice, Donna mentioned that she diced the onions finely (and I see she didn’t use too many either!) because Mr. W doesn’t like to many onions. Hmm, he has that in common with Grumpy. I LOVE onions and tend to add a lot and when I do I hear it from Grumpy! Bring vegetable broth to a boil. Turn off heat, add saffron, salt and pepper then set aside. In a medium saucepan, saute the onion in the 2 tablespoons of butter until softened. Add the basmati rice and stir over medium high heat until the rice begins to brown. Add the broth mixture to the rice, return to a boil then turn heat down to simmer, cover pot, and simmer about 10 minutes or until rice has absorbed water and is no longer crunchy. To toast almonds – while rice is cooking place the almonds in a 350 degree oven. Watch carefully and stir often as they will burn quickly. Once browned, remove from oven and transfer to bowl until ready to add to pilaf. 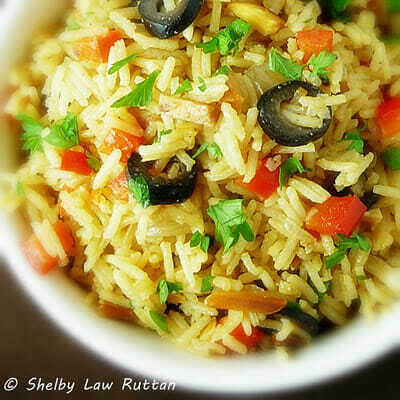 Remove rice from heat and stir in red pepper, black olives, almonds, and parsley. Serve immediately. You do not need to saute the red pepper – so don’t be tempted to add it to the onions. It will be mushy if you do. Just stirring them in after the rice is cooked is good enough as the heat and steam from the cooked rice will soften them a little. It is nice to have them had a little crispiness in the dish – the nuts add that awesome crunch too – I chopped mine up a little after toasting them. We just made this for dinner with a piece of fish. I have had a small stash of saffron fora while now, and don't think to use it often enough. This was very tasty and aromatic! We didn't have black olives so we used kalamata, they rounded out the dish nicely. Thanks for the post, I encourage your followers to try this as a nice addition to a yummy meal! This looks like a great new side dish idea! Good choice. This looks delicious! I love the addition of the olives. 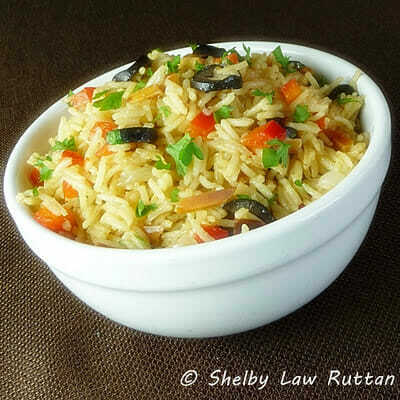 Shelby, you did such an amazing job on the Saffron Walnut Rice Pilaf. I LOVE your additions and personalization. I am a huge olive fan. Love your blog too, I am your newest Facebook Fan! What a beautiful rice dish, Shelby! Great choice! Yum! 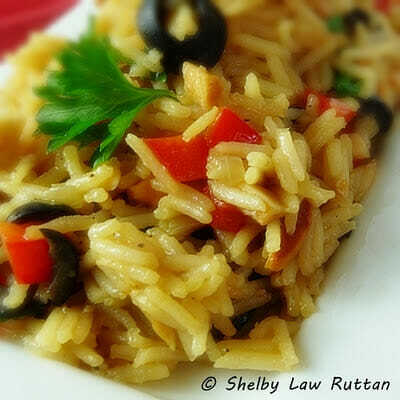 This homemade pilaf looks delicious! So glad you got a chance to post this – I could eat a whole bowl of it! Perfect choice for SRC!! Such beautiful colors and the taste must be wonderful. Lovely! This dish has great colors – yum! i have got to try this. i have saffron in my cupboard just begging to be used. Just gorgeous Shelby! Looks absolutely delicious! The colors are beautiful and the combination of flavors looks devine. Shelby, you added to my my husband's need and want list. The celiac means, I cook rice, a lot and I am always on the lookout for new recipes. This one looks and sounds terrific. I might have left out the olives, if you had not mentioned, they passed muster with your hubby. Great Side Dish. I love her blog, also. Such great recipes. This one looks very tasty and very easy.